This art series is more like the monsters I've never actually used in a game series. 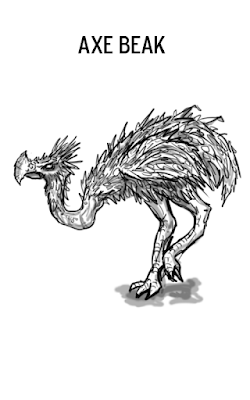 I think the axe beak is pretty cool, I mean, it is weird dumb creature- the ostrich just fantasized up a bit. I could see goblin tribes riding them across dusty badlands. A nice exotic animal to hunt. I bet they taste delicious. Tomorrow- Aarakocra. wow, this looks amazing I could see goblin tribes riding them across dusty badlands. I’m concerned that I may have made them too uncool. I could see it in an open savanna or a cool dungeon under a rainforest. Nice. don't forget your idea. If you're interested in saving money on energy bills visit my website. I think the axe beak is pretty cool, I mean, it is weird dumb creature- the ostrich just fantasized up a bit.!!! The ostrich just fantasized up a bit. I could see goblin tribes riding them across dusty badlands.!!! A nice exotic animal to hunt. I bet they taste delicious. Tomorrow- Aarakocra.